Designed for using in collective antenna systems receiving terrestrial digital TV (DVB-T) programs in detached houses, schools, hospitals, etc. 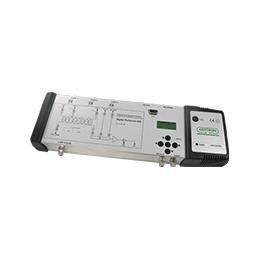 Even situated in places with difficult reception conditions where received signals have different levels and are coming from different directions. Amplifier designed for receiving these channels, selecting requested channels, equalizing their levels and amplifying them. Selective amplification of up to 8 UHF signals. Each of these filters can have 1...6 channels (8...48 MHz) bandwidth. Built-in RS-232 port, LCD and μP controller. Import and export function to facilitate transfer of settings between different DPF008’s. Fine tune function to more easily solve difficult reception conditions. Remote powering of mastheadamplifiers using 12V or 24V. Ready for digital terrestrial TV transmission (DVB-T).